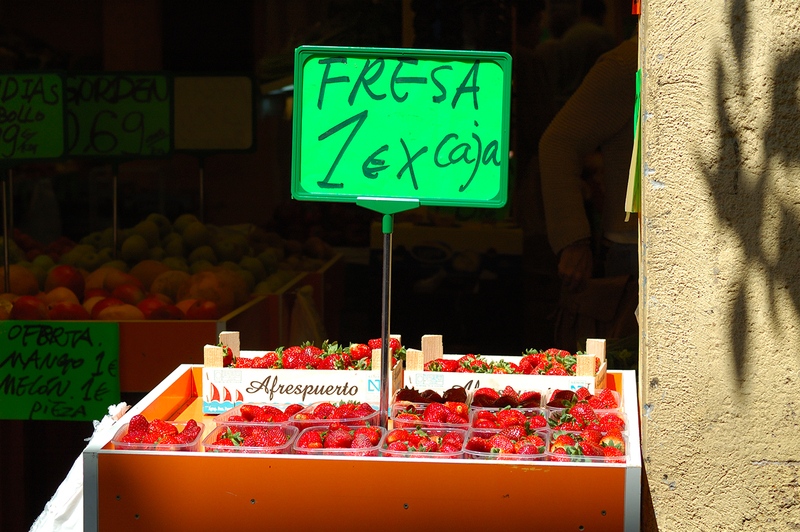 A fruit stand in front of Travessera de Gracia market. Nothing out of the ordinary except that it was very cheap. Finding bargains while buying good fruit is not that easy in these times of crisis. It struck me they were selling such beautiful strawberries for just one euro/package. Other products such as mangoes or yellow melons were being sold at 1 euro per unit. I have to confess that I do all the shopping at the supermarket around the corner so findings like today's remind me of the advantages of a good morning walk near traditional markets. Delicious photo! Those Catalan Sausages from your prior posting look pretty yummy, too!